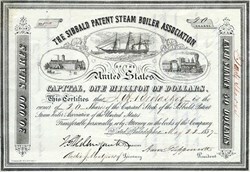 Beautiful certificate from the Sibbald Patent Steam Boiler Association of the United States issued in 1857. This historic document was printed by the D. Chillas Lithograph Company and has an ornate border around it with a vignette of the company name with a train, old sailing ship and building displayed underneath. This item has the signatures of the Company�s President, Aaron Leppancok, Secretary, Austin J. Montgomery and Treasurer, and is over 152 years old.